Lithium X Acquires Large, High-Grade Lithium Brine Project in Argentina | Energy and Gold Ltd.
VANCOUVER and TORONTO, March 3, 2016 /CNW/ – Lithium X Energy Corp. (“Lithium X”, or the “Company”) (TSX-V: LIX) is pleased to announce that the Company has entered into a binding letter of agreement (the “Agreement”) with Aberdeen International Inc. (“Aberdeen”) (TSX:AAB) to acquire up to 80% of Potasio y Litio de Argentina SA (“PLASA”), which owns 100% of the Sal de los Angeles lithium-potash brine project, which was previously known as the Diablillos Project (“Sal de los Angeles Project”, or the “Project”) in Argentina. “The election of President Mauricio Macri has increased investor optimism and enhanced the business climate in Argentina.” Matysek added. Lithium X will issue 8,000,000 common shares to Aberdeen International for a 50% interest in the Project on closing. Lithium X has the option for a 26 month period (the “Option”) to acquire an additional 30% interest by issuing common shares worth $5,000,000 to Aberdeen and fulfilling several terms, including incurring $3,000,000 in exploration and development expenditures over a two-year period and completing a feasibility study on the Project. As part of the agreement, Lithium X will be considered the initial operator of the project for as long as the Company maintains interest greater than or equal to 50% in the Joint Venture. “The acquisition is another milestone as Lithium X moves towards our goal of becoming the world’s go-to pure play lithium company,” said CEO Mr. Paes-Braga. In order to exercise the Option for an additional 30% interest, Lithium X must issue common shares to Aberdeen valued at $5,000,000 based on a 10% discount to the 20-day volume-weighted average price of its common shares at the date of exercise. If Lithium X does not exercise the Option, Aberdeen has the right following the option expiry for a 30-day period to acquire a 1% interest in PLASA back from Lithium X for $166,000 in cash. In the event that Lithium X does not meet the expenditure commitment or complete the feasibility study within two years, Lithium X must transfer 20% of the PLASA shares back to Aberdeen, resulting in Lithium X holding 30% of the outstanding PLASA shares. Lithium X and Aberdeen will enter into a shareholder’s agreement governing PLASA following closing that will provide for management of the Project, including that Lithium X shall be the operator, and including other standard joint-venture terms including dilution of interest. Approximately C$19 million has been invested in the property by previous operators, including $16.2 million in work completed at Sal de los Angeles between 2010 to 2015. Work included extensive exploration and definition drilling, pump tests, seismic & gravity geophysical surveys, basin and solute transport models, evaporation and metallurgical testing, and running a continuous pilot ponding plant on-site. A Preliminary Economic Assessment for the Project (the “PEA”) prepared by SRK Consulting (US) on Dec. 22, 2011 for Rodinia Lithium Inc. outlined an operation producing 15,000 tonnes of lithium carbonate (“LC”) per year and approximately 51,000 tonnes of potash (“KCl”). The PEA projected a 34% internal rate of return (“IRR”) pretax and a US$561-million pretax net present value (“NPV”) at an 8% discount rate. The PEA also outlined an option to increase production to 25,000 tonnes LC and 85,000 tonnes potash per year. This increased production scenario generates a much higher pretax NPV estimate of US$964 million, along with a pretax IRR of 36%. The PEA does not include an analysis of after-tax economics. Lithium carbonate pricing of US$5,000 a tonne was used in the PEA. The latest resource statement for the Sal de los Angeles lithium-potash brine deposit, dated Dec. 22, 2011, estimated an inferred brine resource of 2.8 million tonnes of lithium carbonate equivalent and an inferred brine resource of 11.2 million tonnes of potassium chloride equivalent. The average inferred resource grade was estimated at 556 mg/l Li and 6,206 mg/l K. Higher grades were found in the northern portion of the Project, where sufficient land for the construction of well fields and evaporation ponds is 100% owned by PLASA. Lithium X is treating this mineral resource as historical. This historical estimate also uses descriptions such as “in-situ inferred resource” and “recoverable inferred resource” that are not recognized terms under the 2014 CIM Definition Standards on Mineral Resources and Mineral Reserves. A qualified person has not done sufficient work to classify this historical estimate as current mineral resources and the Company is not treating the historical estimate as a current mineral resource for the Sal de los Angeles Project. Lithium X will be completing an up-to-date mineral resource estimate and technical report done in accordance with current NI 43-101 and CIM standards within 180 days of this press release and will reflect or update the results reported in the PEA . Pursuant to the Agreement, Lithium X has agreed to increase its Board of Directors to seven members at its next annual general meeting, after which Aberdeen has the right, so long as it owns over 15% of the outstanding shares of Lithium X, to nominate two members to the Board for a period of one year. After that, so long as it holds 10% of the outstanding shares of Lithium X, Aberdeen has the right to nominate one member to the Board. Aberdeen also has a pro rata right to participate on any future equity financings so long as it holds a minimum of 8 million Lithium X common shares and 10% of the outstanding shares. A finder’s fee of up to 400,000 shares will be paid to third parties by Lithium X. The transaction is subject to the parties entering into a definitive agreement in respect of the acquisition by April 15, 2016, and to the approval of the Toronto Stock Exchange and the TSX Venture Exchange. The technical information contained in this news release has been reviewed and approved by William Randall, P.Geo, who is a Qualified Person as defined under NI 43-101. As Vice-President Project Development of the Company, Mr. Randall is not considered independent. Lithium X Energy Corp. is a lithium exploration and development company with a focus on becoming a low-cost supplier for the burgeoning lithium battery industry. The Company is exploring a large land package in Nevada’s Clayton Valley, contiguous to the only producing lithium operation in North America – Silver Peak, owned and operated by Albemarle, the world’s largest lithium producer. Lithium X is listed on the TSXV under the trading symbol LIX. Aberdeen International is a private equity investor and advisor focusing on the global mining and natural resources industry. African Thunder Platinum, Aberdeen’s premiere investment, is a lower-cost platinum group metals producer in South Africa’s well-known Bushveld Complex. Aberdeen has further enhanced its mineral investment holdings with the acquisition of the Diablillos lithium/potash project in Argentina. For additional information, please visit our website at www.aberdeeninternational.caand follow us on Facebook, Twitter, LinkedIn and check out Aberdeen’s YouTube Channel. This news release contains certain forward-looking information and forward-looking statements within the meaning of applicable securities legislation (collectively “forward-looking statements”). Certain information contained herein constitutes “forward-looking information” under Canadian securities legislation. Generally, forward-looking information can be identified by the use of forward-looking terminology such as “expects”, “believes”, “aims to”, “plans to” or “intends to” or variations of such words and phrases or statements that certain actions, events or results “will” occur. Forward-looking statements are based on the opinions and estimates of management as of the date such statements are made and they are subject to known and unknown risks, uncertainties and other factors that may cause the actual results, level of activity, performance or achievements of the Company to be materially different from those expressed by such forward-looking statements or forward-looking information, standard transaction risks; impact of the transaction on the parties; and risks relating to financings; regulatory approvals; foreign country operations and volatile share prices. Although management of the Company has attempted to identify important factors that could cause actual results to differ materially from those contained in forward-looking statements or forward-looking information, there may be other factors that cause results not to be as anticipated, estimated or intended. There can be no assurance that such statements will prove to be accurate, as actual results and future events could differ materially from those anticipated in such statements. Accordingly, readers should not place undue reliance on forward-looking statements and forward looking information. The Company does not undertake to update any forward-looking statements or forward-looking information that are incorporated by reference herein, except as required by applicable securities laws. 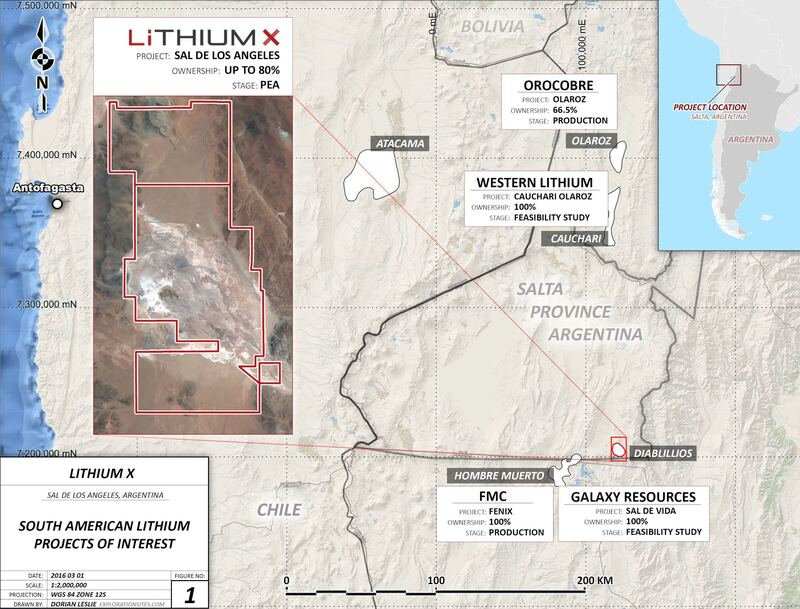 SOURCE Lithium X Energy Corp.